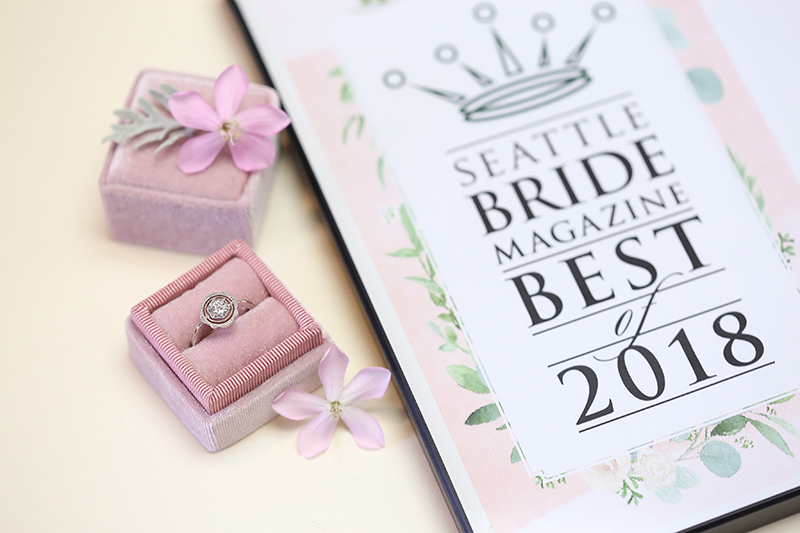 For the 6th straight year, the Puget Sound wedding community has nominated Green Lake for ‘Best Locally Made Jewelry’ and ‘Best Engagement Rings and Wedding Bands’ in the annual Best of Bride Awards from Seattle Bride Magazine — and we won (again)! With other great area jewelers also nominated in these categories each year, it’s humbling to accept such a proud distinction, no matter how many times we’re awarded it. It’s taken us decades to develop a reputation for dependability and craftsmanship with the public, and a lot of hard work from a team of dedicated artists to earn that trust. We’ll place one of each award in both our Seattle and Bellevue studios, alongside those from 2012 and on, all with an enormous amount of pride! Thanks to Lynnsey Phillips, photographer, and owner at Lion Lady Photography, for collaborating on this year’s Green Lake Look Book and lending such beautiful shot to the 2018 Fall/Winter issue of Seattle Bride Magazine.